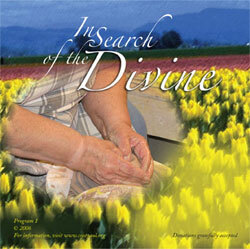 In our first edition of In Search of the Divine, Sister Jean Nelson, CSJ, explains why throwing pots is like life; Bataan Death March survivor, Ken Porwell, describes how a simple act of compassion gave a prisoner the will to live; how Tibetan chants are scored is explained; and peace activist Sister Rita Steinhagen, CSJ, describes her fascinating life committed to justice. Its runtime is 29 minutes. Request a copy or make a comment about this program. The following are brief clips from episode #1 of In Search of the Divine.